Seattle, Washington, has a left-coast vibe with a high tech spin. The birthplace of Jimi Hendrix and Kurt Cobain has an appealing laid-back vibe and is accepting of alternative lifestyles, but hosting companies like Microsoft and Boeing means you're as likely to run into a systems engineer as a grunge rocker. Well known for its rain, Seattle, Washington is a city of approximately 600,000 people sandwiched between the salt water of Puget Sound and the fresh water of Lake Washington. To the north is the Canadian province of British Columbia. To the west are the Olympic Mountains, to the east the Cascade Range including just off to the southeast is Mount Rainier, the highest peak in the Cascades, and easily visible on a clear day from Seattle. Downtown Seattle is a hub for commercial and retail activities. Other neighborhoods with more active vibes include Ballard, Capitol Hill, Columbia City, Fremont, Greenlake, Lake City, Pioneer Square, Uptown, the University District and Wallingford. South lake Union, a former light industrial district is also growing into it's own with a number of biotech, residential, retail and the new Amazon.com campus. The remaining neighborhoods are primarily residential. A good source for information on Seattle area neighborhoods is the city's Department of Neighborhoods. In 1962 Seattle hosted the world fair, and decided on a theme of Century 21, and wanted something futurist to be the visual anchor point for the fair grounds. Inspired by the Stuttgart TV tower in Germany, the architects decided on a tower, eventually topping the tower with a flying saucer to represent the Jetson-esque world that would await us in the year 2000. The needle includes the Sky City restaurant, the world's "first" revolving restaurant. Seattle has a number of piers jutting out into Elliot Bay, originally built to handle Pacific sea traffic, most of the piers now house tourist attractions or cruise ships. Seattle still is the 9th busiest port in the USA, though the majority of the cargo traffic is handled away from the downtown core nowadays. There is a sculpture garden near the north end of the waterfront. Sure, this corporate behemoth can be found all over the world, but, as is fitting for a city with so much rain, the original Starbucks is still open, and serves as both a tourist attraction and a coffee stand. The original logo of a bare-breasted mermaid on a brown background is proudly displayed in the original store. With over 200 coffee shops in the center city neighborhoods alone, there are also many other local coffee houses to try. Place Market, a 9 acre public market in operation since 1907, selling everything from produce to tourist kitsch. 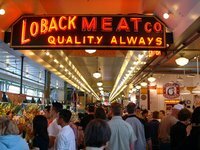 The most popular attraction in Pike Place Market, however, is the Pike Place Fish Market. The fishmongers at the Pike Place Fish Market don’t hand each other fish, they toss them full force at each other. The Pike Place Fish Market has been featured on many TV shows, and you are bound to see them on any TV show featuring Seattle tossing fish out into the crowds. There is also a walking Ghost Tour. Hundreds of concerts and dozens of festivals take place throughout Seattle. While there are festivals all year long, the bulk of these are concentrated between the months of May and September. The NW Folklife Festival at the Seattle Center at is considered the kickoff event for the festival season and the Bumbershoot music festival over Labor Day weekend hearkens the end of the season. A series of cultural festivals at Seattle Center. The Seattle International Film Festival takes place across many theaters and is the largest (by number of films) and longest running film festival in the U.S.
One of the largest festivals, Seafair, takes place through out the city and includes events such as neighborhood festivals, a parade and hydroplane races. Seattle also has strong holiday traditions which include a downtown and area malls bustling with shoppers, carolers and the like. There are also many traditional activities such as the lighting of the Westlake holiday tree, Westlake Carousel, Santa at Nordstrom's and an ice skating rink at the Seattle Center. The Macy's parade on the day after Thanksgiving is also a long standing tradition in Seattle, but there are rumors that it may not continue. Seattle generally has a wet climate. Look outside at any given moment in Seattle and you are likely to see overcast clouds. While it rains often, it doesn't rain very much and the city gets an annual rainfall of about 37 inches (940 mm) – less than New York, Honolulu or Miami. On average, it rains in Seattle at least half of the time, and the wettest months are between January and May and between October and December. The weather also varies quite a bit over short geographies in the region and even within short periods of time within a given day. During the autumn and early winter there are often heavy winds. Other than heavy wind and occasional flooding there has historically been little in the way of natural disasters in the region. Seattle weather is quite mild compared to other areas of the United States with very little in the ways of extreme temperature or precipitation. Seattle-Tacoma International Airport (IATA: SEA, ICAO: KSEA) serves the cities of Seattle and Tacoma. Also known as Seattle-Tacoma Airport, it is located south of Seattle, about 1.5 miles (2.4 kilometres) from Interstate 5. The major airlines using this airport are Alaska Airlines, Horizon Air, Southwest Airlines, United Airlines and Northwest Airlines. In total, there are about 25 airlines serving the airport, with main destinations being Toronto, Calgary, Vancouver, Amsterdam, Paris, Atlanta, Anchorage, Boston, Chicago, Cancun, Dallas, Houston, Denver, Honolulu, Miami, Las Vegas, Los Angeles, Phoenix, Washington, D.C., San Diego, New York City, Seoul, London, Beijing, Tokyo, Memphis, Detroit, Osaka, Salt Lake City, Taipei, Reykjavik, Frankfurt, Seoul, Albuquerque, Baltimore, Nashville, St. Louis, San Francisco, Philadelphia and Charlotte. Car: The drive to downtown Seattle from Seattle-Tacoma Airport will take 20 to 30 minutes, depending on the traffic. If you are driving yourself, from the airport to downtown Seattle, start going towards the AIRPORT EXIT on NORTH EXIT WAY, take the WA-518 EAST ramp, merge on WA-518 EAST, take the I-5 NORTH EXIT, merge on I-5 NORTH and head north for 10 miles (16 kilometres). You will see the Seattle skyline approaching as you near downtown. There are several downtown exits; exit 165 will take you to Seneca Street in the heart of downtown Seattle; if you take exit 167 and follow the SEATTLE CENTER signs, this will take you to the Seattle Center and the Space Needle. A trip to downtown Seattle from the airport on public transportation takes 30 to 40 minutes. King Couny Metro buses and and Sound Transit regional express buses offer services. There is also a scheduled bus service to downtown Vancouver, Canada through Quick Shuttle, with other pick up stops at downtown Seattle, Bellingham International Airport, and drop off stops just inside the Canadian-U.S. boundary and at Vancouver International Airport. Rail: There is also now a light rail option for getting to Downtown Seattle from Sea-Tac Airport. This Central Link is operated by Sound Transit. Taxis, rental cars and door-to-door shuttle service are available. Rental car options include companies like Hertz, Avis, Budget, Thrifty, Enterprise and Alamo/National. The Amtrak Cascades between Seattle and Vancouver, Canada, and Seattle south to Eugene, via Tacoma, Portland and Salem. The Coast Starlight between Seattle and Los Angeles, via Portland. The Empire Builder between Seattle and Chicago. The main road feeding traffic into and out of Seattle is Interstate 5. I-5 runs north-south. There are also two major freeways between Seattle and cities in eastern King County. These are Interstate 90 and Interstate 405. I-90 runs east-west and 405 forms a loop, connecting with I-5 north and south of Seattle. Community Transit is the transit system for Snohomish County. Includes commuter service to cities in King County, including Seattle. King County water taxi runs from West Seattle to the downtown Seattle waterfront. Seattle is a notoriously congested city with rush hours sometimes blending into each other. If you must drive, be prepared for sudden changes in weather as there can be rain, sun, ice and fog all in a short period of time. Sudden rains can often create slick roadways as oil pools up on the asphalt. Public transport is easy and plentiful. By and large, Seattle relies on buses to get around. Be aware that there are multiple systems so you may need to ask around to get the right bus schedule. There is, however, one regional transit pass (called ORCA) that can now be loaded with funds to cover all local systems, including the ferries and commuter trains. Without the pass, you no longer get paper transfers so it is a good investment if you use public transit. Seattle is a surprisingly walkable city despite it's many tall hills. Once away from the core, however, there are many neighborhoods without sidewalks, so one must be careful when walking in the immediate suburbs. In recent years, there has been increased campaigning for bike-friendly infrastructure and numerous lanes and "sharrows" (shared bike/car lanes) have been marked throughout the city. There is also the 27-mile Burke-Gilman which is popular both for recreational and commuter biking. According to the Seattle Department of Transportation: "Seattle has about 28 miles (45 kilometres) of shared use paths, 22 miles (35 kilometres) of on-street, striped bike lanes, and about 90 miles (145 kilometres) of signed bike routes." Local chains and hole-in-the-wall restaurants dominate the city's dining atmosphere, and hearty, inexpensive meals can be found all over the city. Note that many Seattle restaurants, particularly the hole-in-the-wall establishments, only accept cash. Seattle has an enviable variety of foods and is especially well known for it's diverse selection of Asian based culinary venues including Thai, Vietnamese, Japanese, Chinese, Korean BBQ, among others. Other "ethnic" food outlets also abound such as Ethiopian and Middle Eastern restaurants. 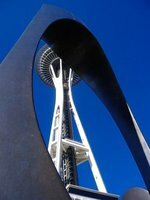 Urban Spoon maintains an excellent guide to Seattle restaurants. If you are interested in dining in, there has traditionally been a dearth of supermarkets, especially in the southern neighborhoods and downtown areas. This has been changing in recent years, however. Farmers markets are also an option (some are seasonal so check ahead for hours and locations). This includes the famous year-round Pike Place Market. The nightlife scene in Seattle used to be about going out to see grunge or industrial bands in local bars and taverns. Back in the 1990s there were dozens of these places throughout the city. Many are now defunct including the famous OK Hotel (made famous by the movie Singles). However, there are still a ton of great places to choose from for a drink. Happy Hour in Seattle maintains a list of happy hour times and locales throughout the city including prices. A local magazine, The Stranger also maintains a comprehensive list of local watering holes. For such a large city, there is a surprising lack of accommodation options available, thus rooms in Seattle are more on the expensive side. Most sleeping options are in Downtown and consist mostly of mid-range or high-end hotels. Other options, especially budget hotels and hostels can be found near the Seattle Center, the University District, the International District, and in North Seattle. There are also bed and breakfast options in Fremont, Ballard, and Capitol Hill. Steer clear of the motels along Aurora Avenue N, as there are many sketchy places where you stay at your own risk. Alternatives to Seattle accommodations are a train ride away south in Tukwila & SeaTac, especially the areas surrounding the airport but also down in an area by SouthCenter Mall in Tukwila, as there are plenty more hotels to choose from with a wide range of rates. You can also find more options for hotels across the I-90 bridge to Bellevue or other towns on the other side of Lake Washington, such as Kirkland, Issaquah, or Renton. The Seattle visitors site offers links to hotel and hostels in the area, and can be found by following this link. Ace Hotel, 2423 1st Ave, ☎ +1 206 448-4721. Budget hotel in the Belltown area. Rooms have an option of shared bath. Minimum furniture and quaint. Shared bath rooms from $120, deluxe from $200. City Hostel Seattle, 2327 2nd Ave, ☎ +1 206 706-3255, toll-free: +1-877-846-7835. Warm friendly accommodation. Private room available. Free breakfast and Wi-fi. All rooms have murals painted by local artists. $25 dorms. Green Tortoise Hostel, 105b Pike St (right across the street from the famous Pike Place Market), ☎ +1 206 340-1222, toll-free: +1-888-424-6783. Has a view of the Puget Sound and the Market, 30 bunk rooms in the elegantly restored Elliot Hotel Building. Free internet stations and WiFi, free dinner 3 nights a week, and free breakfast every morning. The Green Tortoise is a Seattle backpacker institution that also runs festive low-budget bus tours to Mexico and Central America. Hotel Five Seattle, 2200 5th Ave, toll-free: +1-866-383-1830. Its namesake comes from the site of the hotel at Fifth Avenue, below the monorail tracks. Urban-designed rooms. Complimentary shuttle and bike to roam the city. From $125. La Quinta Inn & Suites Seattle Downtown, 2224 8th Ave, ☎ +1 206 624-6820, toll-free: +1-877-846-7835. Very close to Seattle Center and the downtown shopping core. High-speed internet in rooms and free breakfast included. From $130. Belltown Inn, 2301 3rd Avenue, ☎ +1 206 529-3700. This little establishment at the heart of Belltown offers kitchenette on every room. Rooms only have fans for summer. From $190. Executive Hotel Pacific, 400 Spring St, toll-free: +1-888-388-3932. Check-in: 4PM, check-out: 11AM. A small hotel in the Belltown area. Standard rooms have small bathrooms, deluxe are slightly larger, suites' bedrooms are perfect for a family and features free Internet and newspaper. From $150. Hotel Max, 620 Stewart St, toll-free: +1-866-833-6299. In the heart of downtown, offers an artistic setting for both business and leisure travelers. From $150. Mayflower Park Hotel, 405 Olive Way, ☎ +1 206 623-8700, toll-free: +1-800-426-5100. Check-in: 4PM, check-out: Noon. Built in 1927, the centrally-located hotel retains its classical colors on most of its interior, with modern amenities in the rooms such as flat-screen TV and coffee machine. Wi-Fi is complimentary. From $215. Motif Seattle, 1415 Fifth Ave, ☎ +1 206 971-8000, fax: +1 206 971-8100. Distinctive downtown hotel featuring modern lifestyle amenities, concierge, restaurants and lounges, meeting venues, business & fitness centers, and Seattle's largest rooftop dining patio - a unique Seattle Lodging experience. From $175. Palladian Hotel, 2000 2nd Avenue, ☎ +1 206 448-1111, toll-free: +1-855-808-0900. A new addition to the downtown hotel industry, the boutique hotel, developed by Kimpton, adopts a European flair. Every room is equipped with a yoga mat and a daily social (wine) hour is available at the hotel's classic bar. From $200. Renaissance Seattle Hotel, 515 Madison St, ☎ +1 206 583-0300. A full service hotel in the heart of downtown. From $210. The Roosevelt Hotel, 1531 7th Avenue, ☎ +1 206 429-4320. Another boutique and historic option at Belltown. From $180. Warwick Seattle, 401 Lenora Street, ☎ +1 206 443-4300. Check-in: 3PM, check-out: noon. One of the few budget options in the middle of downtown. Rooms have a view of either the skyline or the Space Needle, added with a Juliet balcony. From $150. Alexis Hotel, 1007 1st Ave (near the Coleman ferry docks), ☎ +1 206 624-4844. This art-themed hotel has original works throughout the lobby and in the rooms. Furthermore, it sports a big old Dale Chihuly glass piece in the lobby. From $280. The Edgewater, Pier 67, 2411 Alaskan Way, ☎ +1 206 728-7000, toll-free: +1-800-624-0670. Near the Pike Place Market, right on the water, and famous for three things: you could at one time literally fish right out of your window, it was the site of a notorious Led Zeppelin incident, and the Beatles stayed here during their 1964 tour. Rooms either face the city with no great view other than the Space Needle, or face the water. These latter rooms enjoy the non-stop action of the ferries and cruise liners in the harbor. The restaurant is elegantly decorated with a few outdoor tables right over the water. From $300. The Fairmont Olympic, 411 University St, ☎ +1 206 621-1700. The only hotel in the Northwest to win a five-diamond award. Pulls off grand and luxurious perfectly, is in the middle of downtown. From $300. Hotel 1000, 1000 1st Ave, ☎ +1 206 957-1000. New high-tech, boutique style hotel in downtown. From $250. Hotel Andra, 2000 4th Ave, ☎ +1 206 448-8600. A hotel of a local brand with a luxury and modern touch. Rooms have private bars and ironing boards, with plush Turkish towels and Swedish bath amenities. The in-house Mediterranean restaurant is managed by the locally-renowned restauranteur Tom Douglas. From $300. Hotel Monaco Seattle, 1101 4th Ave, toll-free: +1-800-945-2240. Centrally located in the historic Pike Place Market downtown, facing the waterfront and Elliott Bay. Short walk to Seattle Art Museum, Benaroya Hall, Pioneer Square, Westlake Center, and lots of dining and shopping. From $280. Pan Pacific Hotel Seattle, 2125 Terry Ave, ☎ +1 206 264-8111. Designed by Hirsch Bedner, AAA 4-Diamond award recipient hotel. From $250. Sheraton Seattle, 1400 6th Ave, ☎ +1 206 621-9000. Immediately adjacent to the convention center. From $280. W Seattle, 1112 4th Ave, ☎ +1 206 264-6000. For the terminally hip traveler. Decorated in a stunning palette of black, black, silver, cream, and black. From$280. The Westin Seattle, 1900 5th Ave, ☎ +1 206 728-1000. Perhaps the hotel that has the most rooms in the city. Standard luxurious Westin-style hospitality. It is linked by a skybridge that connects with Westlake Center. From $280. Due to lack of economic diversity Seattle historically went through many boom and bust cycles in the past. These were caused by fallouts in the timber, shipbuilding and aerospace industries. By the time the "dot com" bubble burst however, the economy had sufficiently diversified so that the city came out stronger than its history would suggest. Despite record unemployment in 2009, the region also fared better than most major cities in the United States during the 2008-2009 recession. While Seattle is probably best known for aerospace and software related companies, the largest employment sector is health care and social services. Biotechnology and global health are also growing sectors in the local economy. Some of the largest employers in Seattle include the University of Washington, Amazon.com, Safeco, Starbuck's Coffee Company, the King County government, The City of Seattle, the US Federal Government, Nordstrom's, and the Seattle Community College District. There are also a number of large hospital campuses supporting a number of health care and support positions, especially near Downtown (First Hill) and near the University of Washington at the University of Washington Medical Center and Seattle Children's Hospital. Microsoft and Boeing also continue to be among the top employers regionally. For more information on employment sectors, see the Greater Seattle Datasheet from the City of Seattle. For information on employment in Seattle, you might check out the State of Washington's Department of Employment Security. They have a job search tool online as well. There are several private schools as well as the Seattle Public School District. For reviews on broadband service in Seattle, visit DSL Reports. 3 Seattle Weather and Climate. SEATTLE.GOV. Retrieved on 2010–01–02. We have a comprehensive list of accommodation in Seattle searchable right here on Travellerspoint. You can use our map to quickly compare budget, mid-range or top of the range accommodation in Seattle and areas nearby. This is version 88. Last edited at 12:40 on Dec 3, 18 by Utrecht. 82 articles link to this page.